Want stocks that you don’t have to babysit? Here are two rock-solid dividend stocks that have beaten the market over the long term with less stock-price volatility. Investing in stocks will never be without some risks, but you can limit your risks by favoring certain types of stocks. Look for companies that are leaders in stable industries, operate in spaces that have high barriers to entry, and pay a dividend. While how much you pay for the stock naturally matters, it will matter less as your holding period increases. Two top stocks that fit the bill and have beaten the market over the long term – as the chart below shows -- are Waste Management (NYSE:WM) and American Water Works (NYSE:AWK). 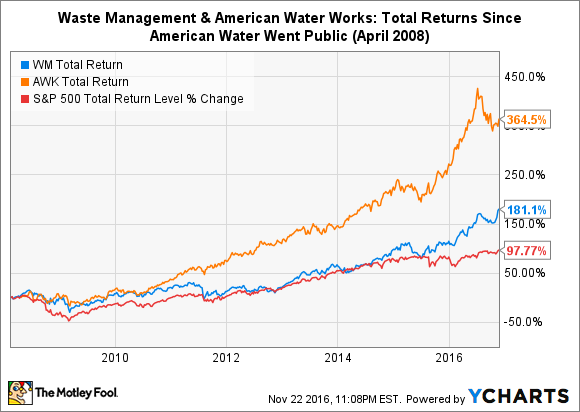 In addition to beating the market over the long term, American Water Works and Waste Management have done so with less stock-price volatility -- surely a plus for investors who prefer low-risk stocks. The stocks of American Water and Waste Management sport betas of 0.23 and 0.72, respectively, which means their stock prices are just 23% and 72% as volatile as the overall market, which has a beta of 1.0. There are few certainties in life, but one of them is that humans will keep generating trash. So there will always be a critical need for the services that Waste Management provides. The company is North America's largest waste management company, providing collection, transfer, recycling, resource recovery, and disposal services to residential, commercial, industrial, and municipal customers. Its nearly $31 billion market capitalization is about 60% larger than that of the industry's second-largest player, Republic Services. Waste Management operates in an industry with substantial barriers to entry, which include high fixed start-up costs as well as regulatory hurdles with respect to landfills. This makes it unattractive for others to enter the market, resulting in less pricing pressure on the existing players As is the case with many leaders in industries with high barriers to entry, Waste Management was an early entrant into the market. While the company was officially founded in 1968, its roots date back to 1893. Waste Management isn't just a stodgy trash collector, though, as it also operates landfill gas-to-energy facilities. Its facilities scattered across North America provide a total of more than 650 megawatts of power capacity per year -- enough to power nearly half a million homes per year. The company is very shareholder-friendly -- it actively buys back its stock and has raised its dividend every year since 2004. Its dividend is currently yielding 2.6%, which is about a 30% premium to the approximate 2% the S&P 500 is yielding. 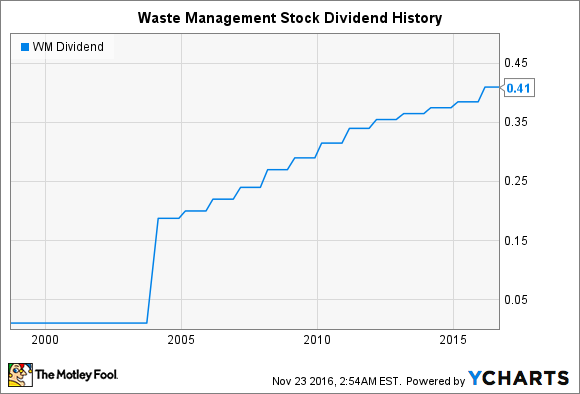 Waste Management has been able to post slow but steady earnings growth over the long term thanks in part to ongoing cost-savings initiatives. For instance, it converted its fleet to run on liquefied natural gas, some of which it produces from its landfill gas. Analysts expect Waste Management to grow year-over-year earnings per share a solid 11.9% in 2016 and at an average annual rate of 10.4% over the next five years. The company routinely exceeds Wall Street expectations, so these estimates might prove too conservative. These features provide the company -- and the stock -- with much stability, making it a great choice for investors in search of a low-risk stock. American Water provides water and wastewater services to about 15 million people in 47 U.S. states and Ontario, Canada. The company operates as a regulated utility in 16 U.S. states, with its regulated business accounting for the lion's share of its total revenue. American Water uses its predictable earnings stream generated from its regulated business to fund its dependable dividend and to make acquisitions in what's an extremely fragmented industry. The company also has several market-based businesses, including providing water and wastewater services to military bases and supplying water to natural gas companies in the Appalachian Basin. Notably, American Water's fracking water business has been holding its own despite the depressed energy market, with the business expected to be cash flow positive in 2016. 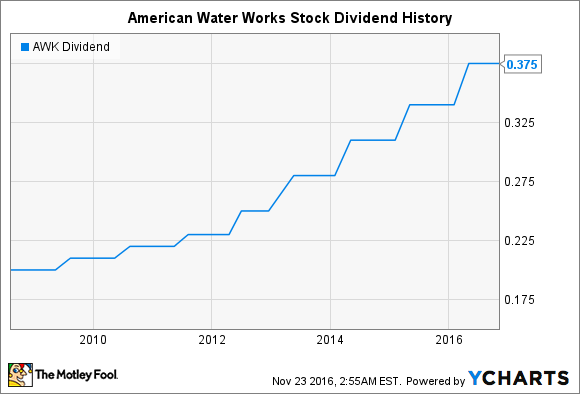 American Water Works stock's current dividend yield is a modest 2.1%. However, the company has raised its dividend every year since it went public, increasing its dividend a total of 88% -- nearly 50% more than the S&P 500's 60% rise during this period. Management said during the third-quarter earnings call that the company remains on track to grow earnings at an average annual rate between 7% and 10% through 2020 (using 2014 as a base).